UNTIL – I happened to spot some beautiful fresh spring peas at Trader Joe’s the other week, and then happened to notice this recipe in Cooking Light. This is a seriously delicious (and healthy!) soup..and a perfect excuse to use my trusty immersion blender once again. Melt butter in a large saucepan over medium heat; add sliced leeks and cook about 5 minutes, until nearly translucent. Add stock, thyme, crushed reds, a pinch of salt and pepper and bring to a low simmer. Add asparagus, cover and cook about 3 minutes, and then add fresh peas. Cook about a minute, then add parsley (you can include the stalks, which will give it an additional pop of green!). Blend soup until smooth with a traditional or an immersion blender. Season to taste and then return to low heat while you prep your eggs. Bring about an inch of salted water to a boil in a small pot. Reduce heat to a simmer, add vinegar, and slowly/carefully add your eggs. Cook about 3-4 minutes, or until the white of the egg firms up around the yolk. 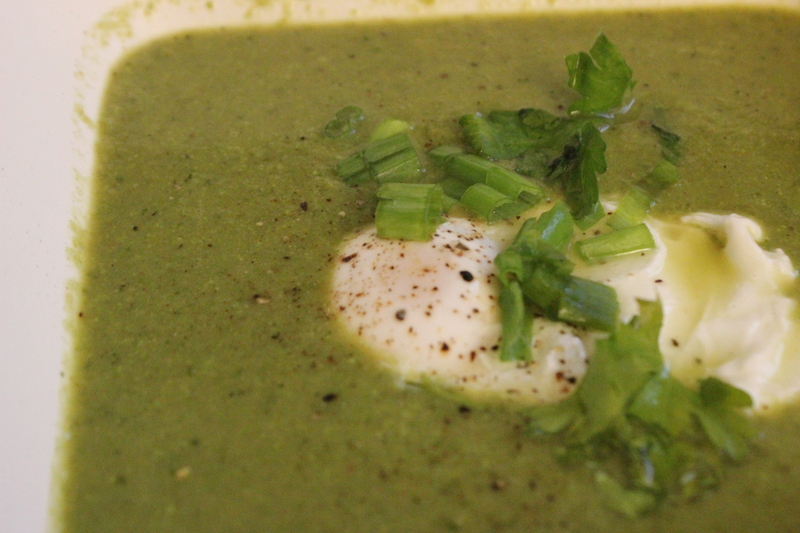 Ladle your soup into bowls and (carefully) add your egg. Top with parsley, additional cracked pepper, and if you like, some olive oil and/or green onions. Break that yolk open and enjoy the bounty. Husband, who is not a fan of eggs (I married him, but do not claim to understand him), gobbled this up and went for seconds. Needless to say, we were both bummed when this only made enough for one more (lunch) meal. Make this. I promise you will not regret it. There is this restaurant called Duke’s Grocery a few blocks down from us that both Husband and I love. We love it so much, in fact, that we once waited almost 2 hours (!!!) for a table for four at brunch. (I will note this was only acceptable because they also serve bottomless Bloody Mary’s and mimosas for $15. One Bloody Mary is $8. Obviously, there is significant positive marginal utility to me, the consumer & lover of all things spicy, horseradish-y, and salty, in this construct). Saturday morning, though, we waltzed right in, and ordered the usual. Burger for him, avocado toast with poached egg for me. And then Sunday morning, it hit me. I had the celery, the horseradish, the tomato juice, the vodka, the sriracha. That’s bottomless for $0. 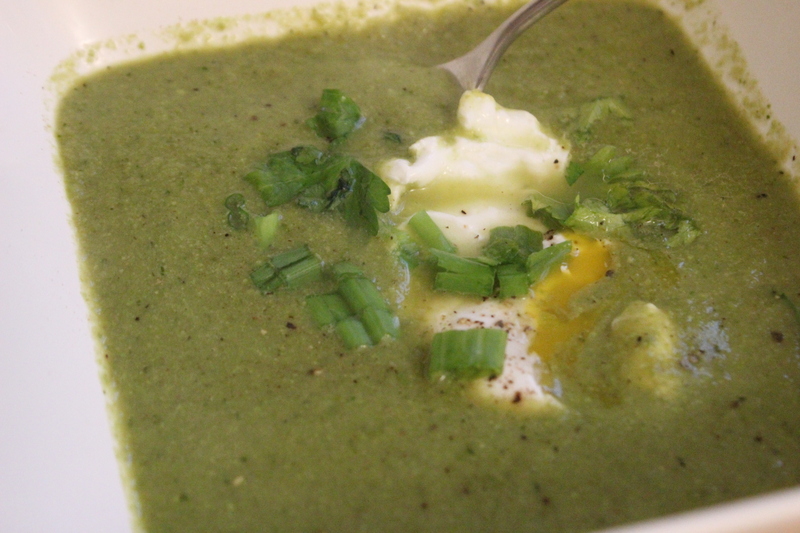 I also had a perfectly ripe avocado, eggs, and some spinach to use up. One epic brunch, coming my way. Bring a small but deep pot to boil. Add about a teaspoon of salt and a teaspoon of vinegar to the pot, reduce the heat until the water only bubbles slightly. Carefully crack one egg and slide it into the water; repeat with second egg. Cook for about 3-5 minutes, or until the egg white firms up around the yolk. Remove (gently!) with a slotted spoon. As your eggs cook, toast your bread. 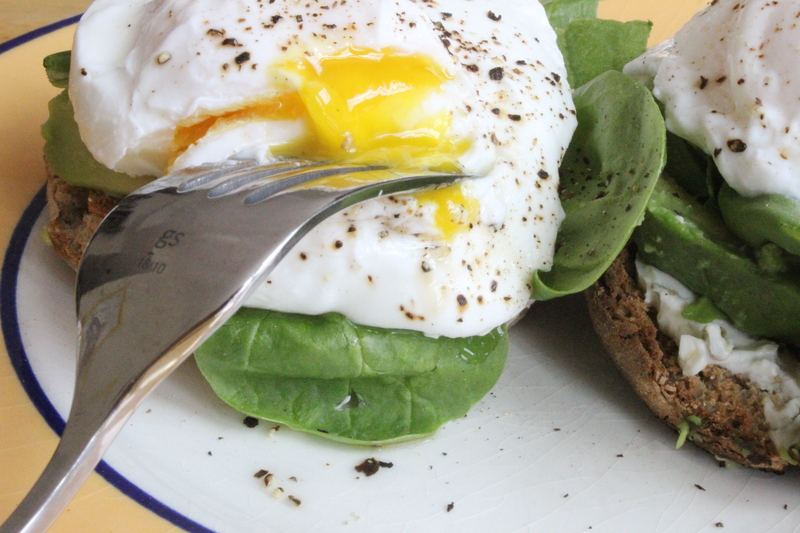 Spread with a bit of cream cheese, top with a few slices of avocado and a bit of arugula or spinach. Top with the poached eggs and sprinkle some cracked salt and pepper over the top. Serve with a Bloody Mary and wish every day were the weekend. 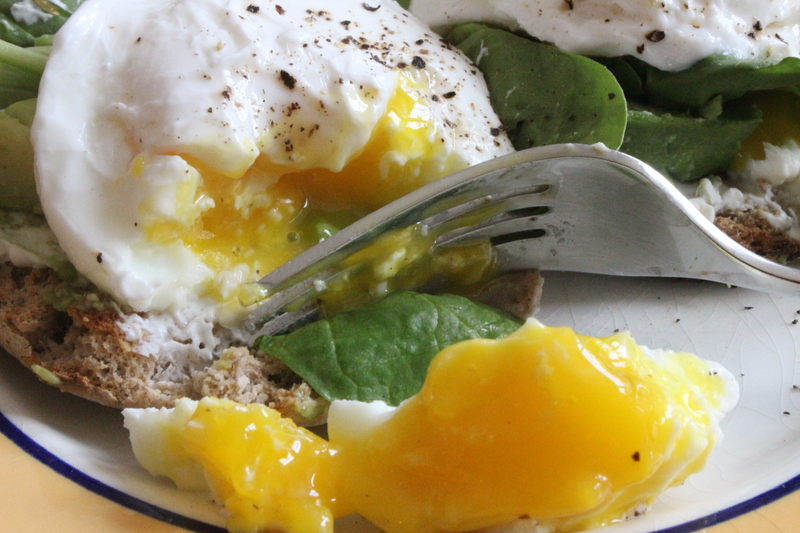 I think poached eggs are a bit of a skill – I get them right about 65% of the time (honestly, who wants an overcooked egg yolk, YUCK)…but I swear to goodness, this was 98% as good as my Duke’s breakfast the day previously. The chief difference, of course, being that at home, I have to wash my own dishes (my chief dishwasher, aka Husband, wasn’t awake yet). 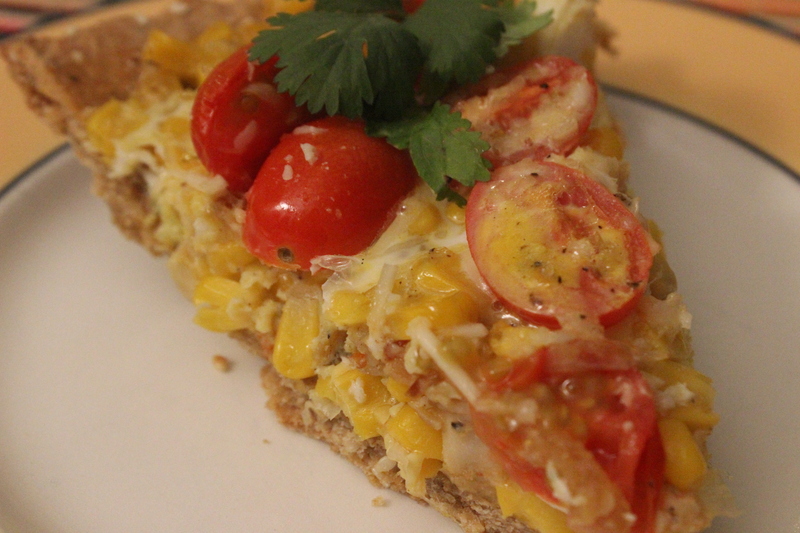 I know, I can’t stop posting about quiches and tarts and things that are technically veggie oriented but are really just carbo-loaded vehicles for cheese consumption. Guilty as charged. On the other hand, when the Husband told me this was “the best ever,” obvi it’s going on the blog. Sorry I’m not sorry. how does this end up looking like a pizza?! Preheat the oven to 375 degrees F. Unroll the pie dough and press into a pie plate. Prick lightly with a fork and bake for about 5-6 minutes, just to get the color nice and light golden. Bonus if you can use a crust protector. In a saute pan, over medium high heat, cook the pancetta until it starts to crisp up. 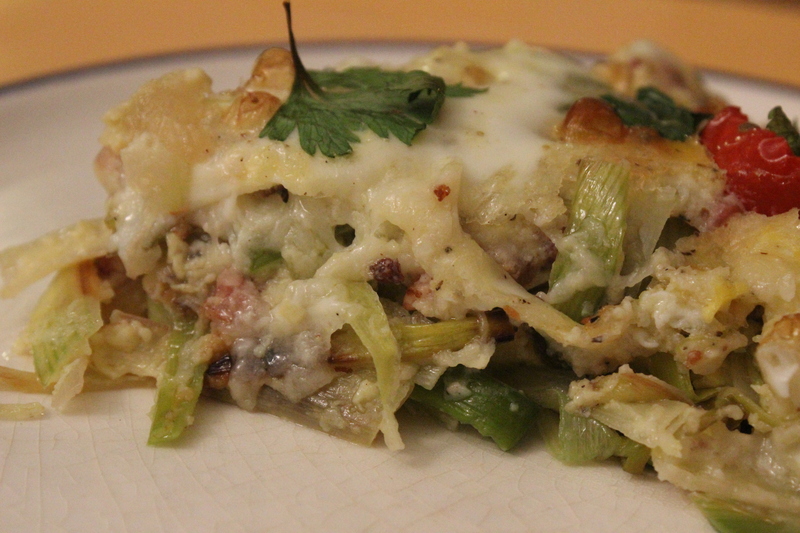 Reduce heat to medium low, and in that nice bacon-y fat, add your sliced leeks. (Note: it will look like a LOT of leeks. Don’t worry – they’ll all fit!). Add salt, pepper, crushed reds, and parsley and let the leeks cook down a good while – about 10-12 minutes, until they’re nice and translucent. Meanwhile, in a separate bowl, whip together eggs, cream, and a pinch of salt/pepper/crushed reds. In your (lightly) baked pie dough, spread the bacon and leek mixture evenly. 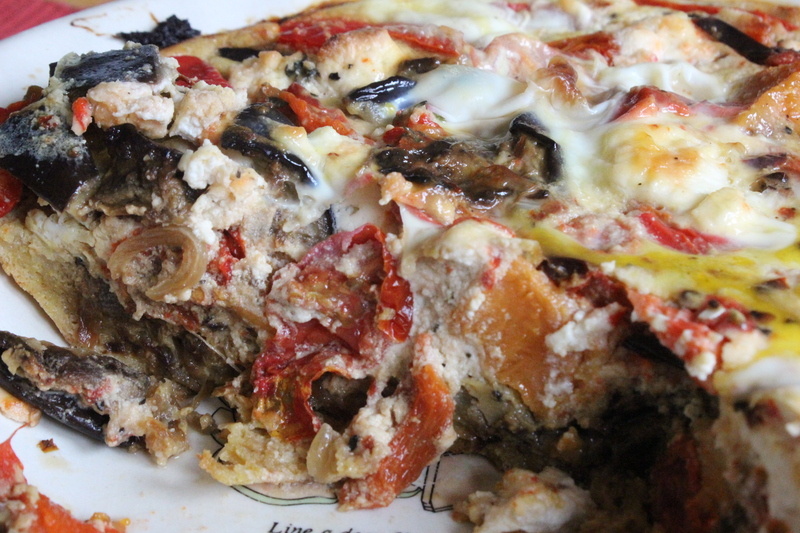 Top with a generous amount of cheese, and then carefully pour the egg/cream mix over the top. 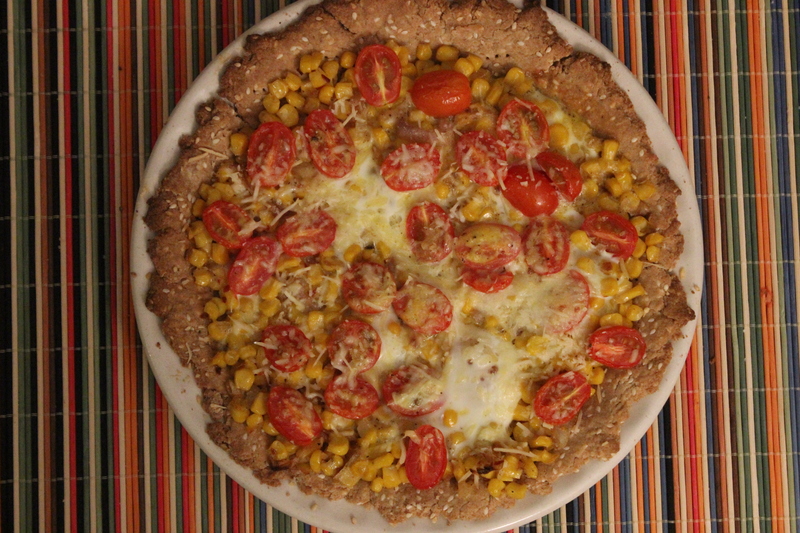 Top, as desired, with cherry tomatoes for an extra pop of color. 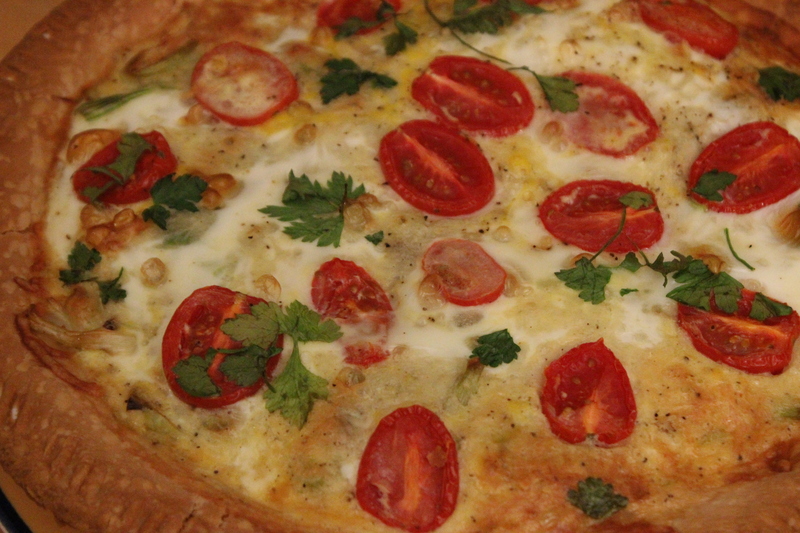 Bake for about 30-35 minutes, or until the crust is nice and golden, and the eggs are cooked all the way through. Top with additional parsley and serve with a side salad. I think we already established the Husband’s verdict. As for me, any day I get to use the crust protector, that’s a good day. 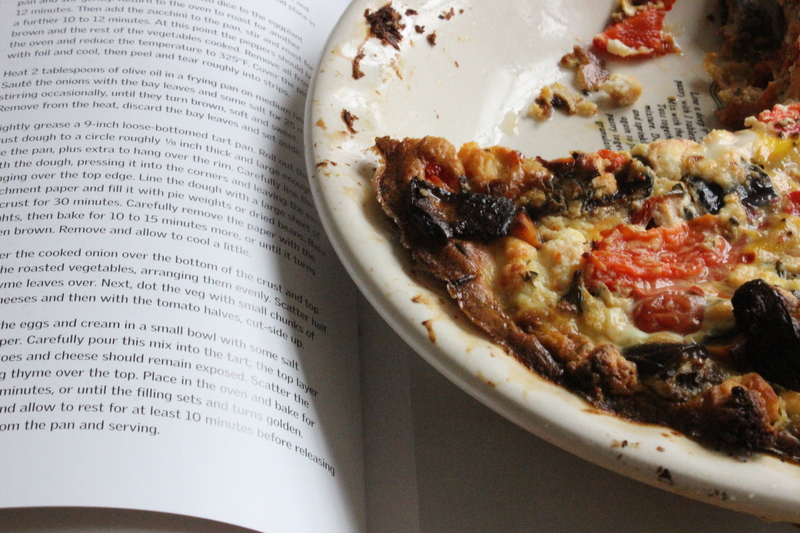 Last week, I had epic plans to make Ottolenghi’s Very Full Tart. Preheat the oven to 450 degrees F. Remove the stem and seeds from the bell pepper, place in ovenproof dish, drizzle a bit of olive oil over it and stick in the oven. Toss the diced eggplant with olive oil, salt, pepper, and a little bit of crushed reds on a large baking dish; stick in the oven for about 10-12 minutes. Add the sweet potato to the eggplant pan and roast another 20 minutes. In a large saute pan, heat some olive oil and saute the onions with bay leaves and a pinch of salt for about 25 minutes, stirring occasionally. Remove all the vegetables (including the pepper) from the oven. Reduce the temperature to about 325 degrees F. Cover the pepper with foil and let cool. When cool enough to handle, peel and chop into smaller slices. Grease the bottom of a pie or tart pan. Spread out the panko bread crumbs on the bottom and halfway up the sides. Scatter the onion over the panko, cover with roasted vegetables (eggplant, sweet potato, bell pepper), and top with about half the thyme leaves. Dot the veggies with both types of cheeses. Scatter the halved tomatoes about the top. Whisk the eggs and cream in a small bowl with salt, pepper and some crushed red peppers. Carefully pour the mix over the veggies and top with the remaining thyme leaves. Bake the tart for about 40 minutes or until the filling sets. Admire your handiwork and serve with a small salad, (topped with any roasted vegetables that didn’t fit into your tart). This came out deliciously, and was great for a number of tasty, subsequent lunches. However, it won’t become a staple around here anytime soon, given that it took 2+ hours to make. This is more of a snow day kind of meal. Which, speaking of, where IS my snow day? !